In Georgia’s first co-ed prison, Marc and Linda are forced to work together to survive. A gripping story of contradictions and surprising twists, it follows the dash to freedom – and eventual love. 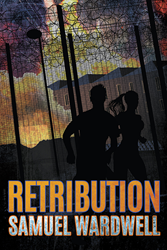 Samuel Wardwell’s new book, Retribution, is a thrilling chase from beginning to end. A law abiding computer architect and a cat-burglar, who has lived on the fringes of society, find themselves in a Georgia prison – the very first co-ed operation of its kind. Threatened with death in this high-tech facility, Marc and Linda face violence and choices that neither of them have could ever have imagined. Solo, they would have been chewed up, spit out, and most likely end up dead – by inmates, by the system, and by their own past enemies – but together, they see a possibility of escape. Reluctantly, they find that by pooling their limited resources, skills, strengths, and knowledge that it may be possible to find their way out alive. Samuel Wardwell was born into a privileged background and went on to earn a substantial education. However, he lost everything due to the results of alcoholism. Eventually incarcerated in Georgia’s prison system then finding sobriety and freedom, he brings to life an adventure loosely based on his own experiences. For more information about the author and his work, visit SamuelWardwell.com.